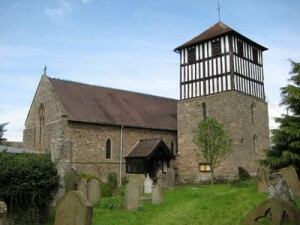 The church of St Bartholomew has a 13th Century detached tower, which like the other detached bell towers in Herefordshire was used as a refuge during attacks by the Welsh.There are six bells in the tower, most of which are extremely old. In the early 19th century the church was in a state of extreme disrepair, and in places was almost disintegrating; the seating inside was nothing but a strange collection of boxes, whilst the font and pulpit were described as “shabby”. Restoration was finally undertaken under the supervision of J.H. Evins a Hereford Architect in the mid 19th century, although because the chancel was not controlled by the parish, that part of the church remained unaltered. However, the Rural Dean made an arrangement with the Dean and Chapter so that he could restore the chancel and he commissioned Mr. Seddon (who restored Llandaff Cathedral) to do the work in due course. The rest of the church masonry was renewed where necessary, and repointed; the 14th century south porch which was falling down was replaced with a wood and stone structure made in a similar style. New oak doors were added to the redressed stone of the doorway, and the porch floor was give Godwin’s encaustic tiles. The old tower, which is detached from the church was repaired and renovated, and was given a new oak door. The roof of the nave was stripped and repaired, and a great many other improvements and renovations were made, including the installing of lovely stalls with carved finials and the replacement of the old trough like font with a carved octagonal one made of Painswick stone. Similarly, the old wooden 17th century pulpit was replaced with a decorated and carved stone one. All frail and equal in their last abode. And friends revere them in their lowly bed. Desires, regrets, delights are all the rest. and solemn silence marks its former place.